Fracture of the ankle is divided into several categories. The treatment is carried out depending on the type of fracture and can be both conservative and operative, as well as stationary. If you suspect that you sustained a fracture, which may manifest itself in the form of sharp or dull pain, swelling, redness, immediately consult a doctor-traumatologist. conservative, surgical or hospital treatment. You take an x-ray and put a cast. But this is only the case if the fracture has displacement in the injured place was cracked. Before the plaster in place large hematoma will introduce a solution of novocaine. Gypsum can only be applied at the fracture, but most often imposed so-called boot when the toes remain free, and the site of fracture and is fixed above the dense plaster. Immediately after the imposition of the latch you will again conduct a test of the x-ray as the joints on the ankle is susceptible to bias. Treatment outpatient appoint, and it can last from 6 to 12 weeks depending on the fracture. That is, the more cracks or fractures, the longer you will have to wear a cast. If the fracture is accompanied by dislocation, before applying the fixing plaster will produce a reduction of the dislocation. This is done with the help of the surgeon's hands, without the use of any tools. Reposition is performed under local anesthesia and may end as well, and not give result. If the offset is extensive, and while there is a strong dislocation, you hospitalitynet, hold the hood and insert the spokes. The hood will have to lie, 4-5 weeks without getting up. After the specified time is repeated x-ray, a plaster, again the. In this case, the disability is delayed for a period up to 6 months. Surgical treatment can be administered in the presence of fragments of bones, whether the failed reduction of the dislocation or displacement, with an open fracture and if the bone is not fused or grown together properly. After treatment you will be given physiotherapy, medical gymnastics, daily fixation with an elastic bandage for 12 months. The ankle cannot be loaded, overtax, wear shoes with a heel, lift weights. Can also prescribe a course of vitamin therapy and follow-up examination. 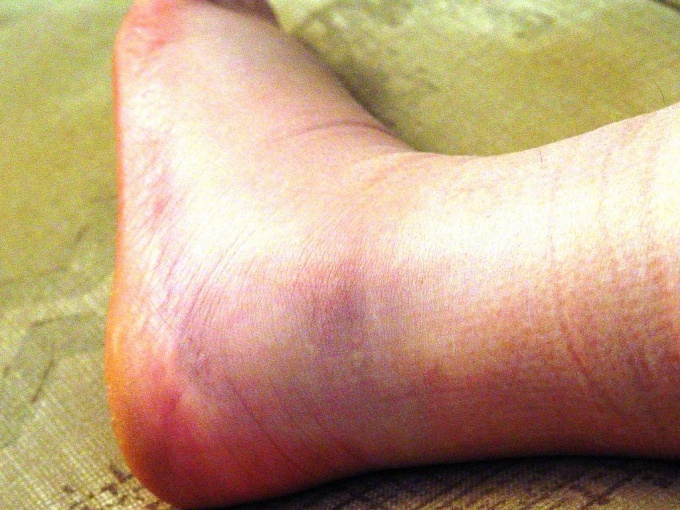 An ankle fracture is a frequent injury occurring in the off-season. Being a witness to an accident, it is important to be able in such cases to provide first aid without hurting the victim. If a person hurt his leg and she took an unnatural appearance, we can assume that there was a fracture with displacement. It is important at this point to provide proper first aid, calling an ambulance beforehand. The injured limb is necessary to try to immobilize, if possible fixing, not trying to change her position. To the patient was easier, you need to put under the leg folded blanket or any clothes to slightly raise the limb. If you have ice or something cold on it, to attach to the leg. This will help to narrow the blood vessels and reduce the formation of hematoma. You can also serve the patient pain medication, but can't drink a lot of water. If you call an ambulance it is impossible for objective reasons, it is necessary to take measures to transport the patient in the emergency room. In this case, the limb should be fixed put it on her splint from appropriate available materials, but you cannot attempt to fix the position of the bones. If nothing suitable at hand, you just need to gently bandage to the injured leg a soft bandage to reduce pain. To transport the patient to the hospital on stretchers or in the back seat of the car in a comfortable position. As a rule, when injury occurs, a simple ankle fracture or fracture with displacement, which, in turn, can be open or closed. In a simple fracture, the patient makes x-ray to ensure that there is no offset, and put into a cast. Treatment in this case may take 3-4 weeks, after which the fracture will grow callus and plaster is removed. When a displaced fracture treatment is much more difficult because it requires surgery and the recovery process in this case takes much more time. The treatment is performed in a hospital, you may need to restorative therapy. In the treatment of complex ankle fracture with displacement mapping to produce the fragments and their fixation with the imposition of special metal plates or postoperative skeletal extracts. The surgery is performed under General anesthesia. Treatment in this case may take a long period, after which the patient may need rehabilitation, if the functions of the limb were broken. To restore mobility of the ankle is assigned to the carrying out of physiotherapeutic measures: appointment of magnetic therapy, the use of compresses, warm paraffin treatment and preventive massage. In some cases, you may want wearing special shoes and arch supports.